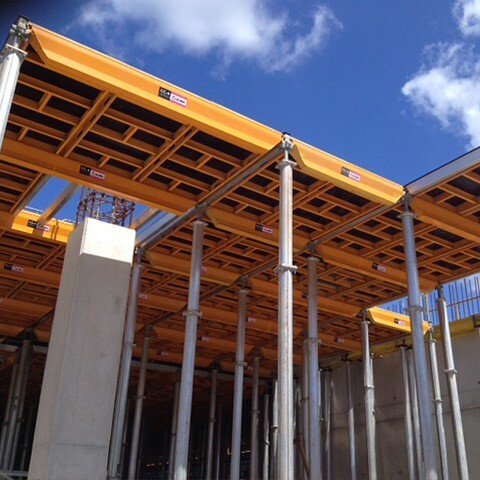 CC-4 is a recoverable horizontal formwork system for both solid and lightened slabs, resulting in a superior concrete finish. CC-4 is a recoverable system for solid or lightened slabs that ensure superior concrete finishing and high-efficiency. 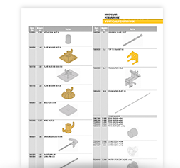 It's perfect for large slabs in building construction, with regular geometry and spans between columns, and high demands for finishing quality. This system allows for quick erection and dismantling times due to its aluminium structure and because it is a fast striking system. This ensures the highest safety standards for formwork assemblers. There are two shuttering types available: with panel (aluminium frame with incorporated board) or with standard plywood. Ideal for large slabs in building construction, with regular geometry and spans between columns, and high demands for finishing quality. Consists of Dropheads CC, Beams CC, Transversals CC TE and Panels CC – panels make up the biggest part of the form face. Repercussion of 0.29 props/m2, with the basic grid size of 2.32 x 1.5m. Designed for slabs adaptable to any kind of geometry and high demands on finishing quality required. The system consists of Dropheads CCT, Beams CC, Transversals CC TR and plywood. Plywood is laid to create the shuttering face. Perimeter protection (with 1.5m handrail). Lightweight – all components < 15kg. Quick strike drophead enables faster cycle times. Stripping and material retrieval can be completed safely without the risk of falls. High assembly efficiency – allows for the assembly of the grid before placing panels or plywood. The formwork face provides superior concrete finishing. A versatile and flexible system allows a change in beam direction and 90 degree assembly is possible. Efficient solutions for infills on column and wall, perimeter protection and safety. Slabs of up to 90cm thick, depending on the grid size in use. For more detailed information download the CC-4 product guide.